Australia’s highest paid vice-chancellor saw his salary package increase by $120,000 last year to reach $1.3 million, an analysis by The Australian of annual reports shows. Michael Spence, head of the University of Sydney, topped the list of 37 vice-chancellors, followed by Greg Craven from the Australian Catholic University ($1.2m); Glyn Davis, University of Melbourne ($1.08m); and Peter Coaldrake, Queensland University of Technology ($1.06m). 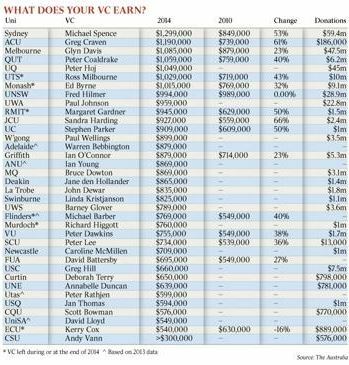 In all, seven vice-chancellors had salary packages over $1m, including two who left or retired. At the other end of the spectrum, the analysis of 2014 annual reports showed Kerry Cox, the recently retired head of Edith Cowan University, to be the country’s lowest paid vice-chancellor on $540,000. The analysis shows that the average salary was $835,000. Male vice-chancellors earned, on average, $853,000 while their eight female counterparts earned an average of $769,000. Jeannie Rea, president of the National Tertiary Education Union, said the gap between the best professors and vice-chancellors had accelerated in recent years. In a year when almost all vice-chancellors supported the fee deregulation legislation of the Coalition government, which included a 20% cut to university funding, staff, students and their families must be dumbfounded at these salary increases. While condemning the outrageous levels of VC remuneration, one also notes the ­gender pay gap is still well entrenched. A survey published by the Chronicle of Higher Education found the average US university president earned $US428,250 ($557,040) — similar to Australia’s lowest paid university heads. Andrew Hamilton, head of Oxford, was on £442,000 ($880,000). The vice-chancellor of Cambridge, Leszek Borysiewicz, wasn’t listed in the top 10 earners. The average UK vice-chancellor’s salary was $520,000. The HES’s analysis of pay increases over the five years from 2010 for those university heads still in the same job reveals some significant pay rises. Sandra Harding, who has just signed on for her third term as head of James Cook University which will take her to the end of 2021, received a 66% pay increase between 2010-14, including a $79,000 increase last year. Other big increases went to Greg Craven, whose pay packet increased from $739,000 in 2010 to $1.2m in 2014 — a 61% pay increase. Spence’s salary has risen by 53% since 2010, while ­Stephen Parker, from the University of Canberra, and Margaret Gardner, the former head of RMIT, both saw their salaries increase by 50% during that time frame. HES also looked at donations and bequests for 2014, although the annual reports of some universities were not available. The analysis shows a broad correlation between vice-chancellors’ pay and the fundraising efforts of their institutions, but mainly driven by Group of Eight universities, which all earned more than $20m in donations and bequests, with the exception of Monash, which attracted $9.1m. University of Technology, Sydney, and QUT were the best performing of the non-Go8s, bringing in $10m and $6.2m respectively. It revealed three universities — Sydney, Melbourne and the University of Queensland — far ahead of the pack in their fundraising activities. Sydney attracted nearly $60m in donations and bequests in 2014, followed by Melbourne with $47.5m and UQ with $45m. At the other end, Southern Cross University attracted just $13,000 in donations last year. 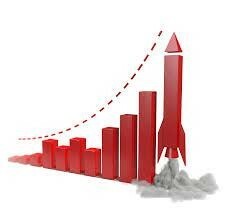 Some VCs paid more in a week that casual academics earn in a year!